The platform bed is great furniture for any bedroom with enough space. It protects the mattress from dust and dirt from the floor. DIY platform bed ideas are mostly simple, and you only need basic carpentry skill to build one. Looking for a new platform bed at home? These 20 ideas serve as great inspirations for your home building project. 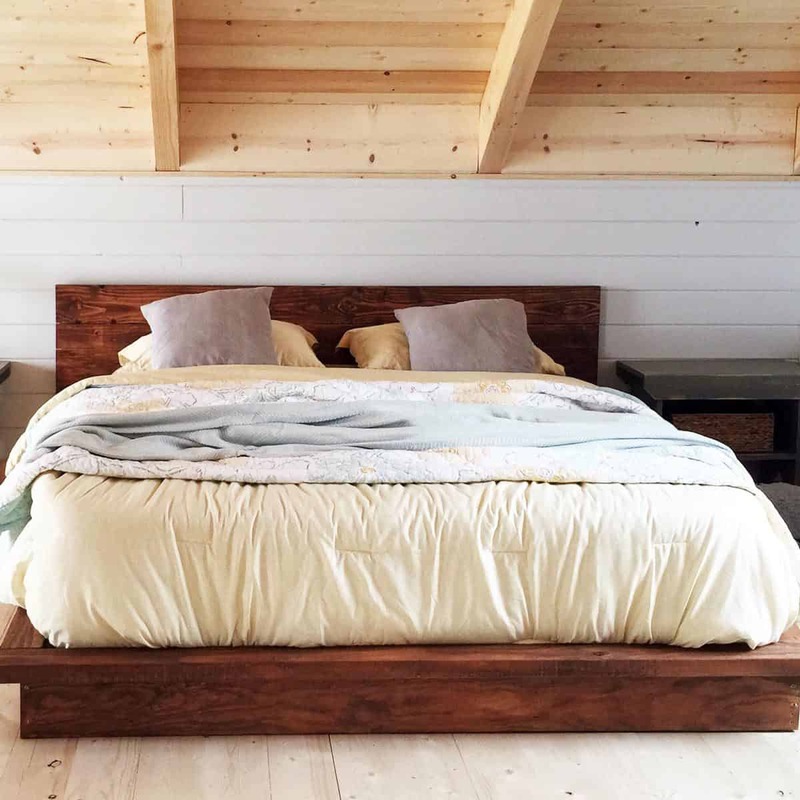 This simple floating platform bed was made of painted scrap plywood. The hidden supports create a modern, floating look. The plywood extends to a simple nightstand “box”, which can be opened from above. Dark coat hides the imperfection of scrap plywood. 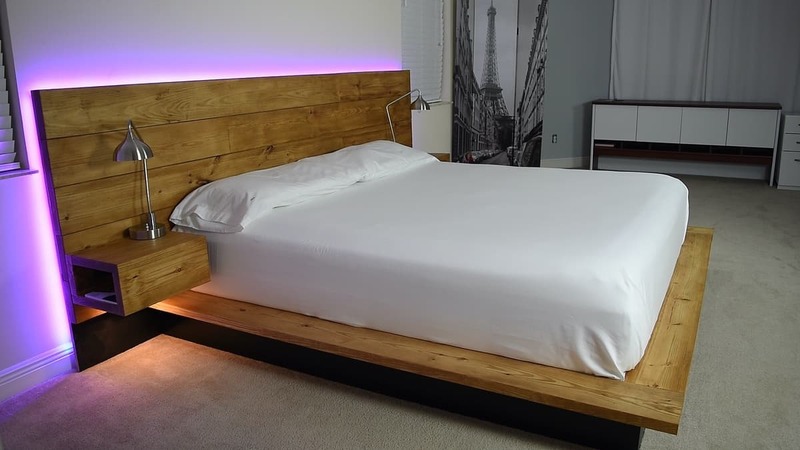 This simple platform bed was constructed from pinewood. The washed stain adds a rustic, farmhouse-like look. The pale color looks welcoming and homey when paired with white-grey pillows and cover. White, flea-market nightstand and simple lamp add the cozy feel. 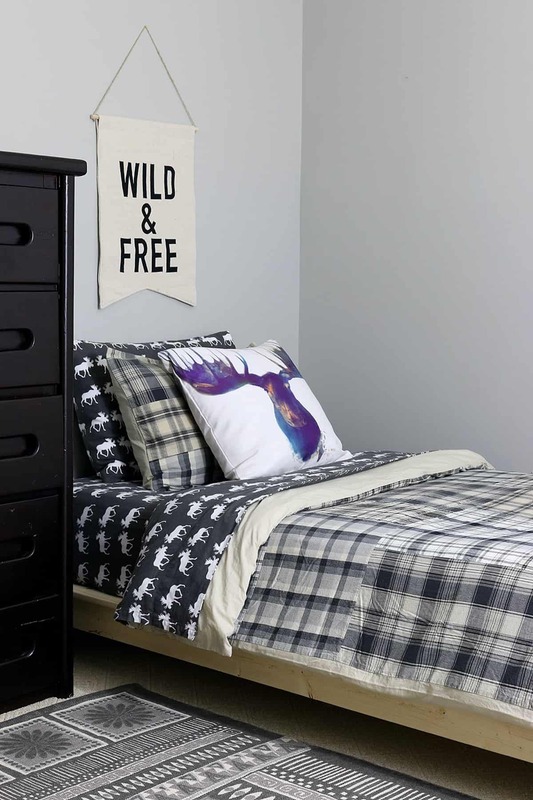 This single platform bed has a twin size to accommodate a teenage kid. The mattress is supported by a simple “frame” without a headboard. The simple wood is compensated with patterned bedcover and fun-looking pillows. This platform bad was constructed with reclaimed wood. The surface was not painted, and the distressed look adds the authentic look. The headboard consists of several jointed panels. The simple look and wood grain patterns create a farmhouse-like vibe. 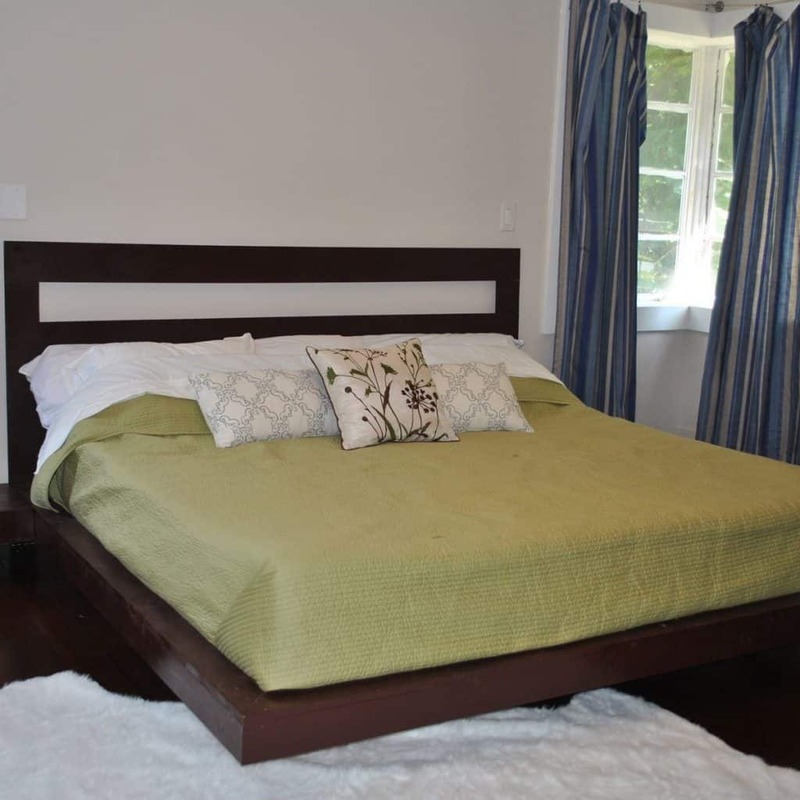 This platform bed was constructed low to accommodate a loft room. The main material was dark, recycled wooden panels. The simple headboard and straightforward shape create a rustic, comfortable look. The dark wood looks great with light-colored fabric. This platform bed was constructed for a teenager. 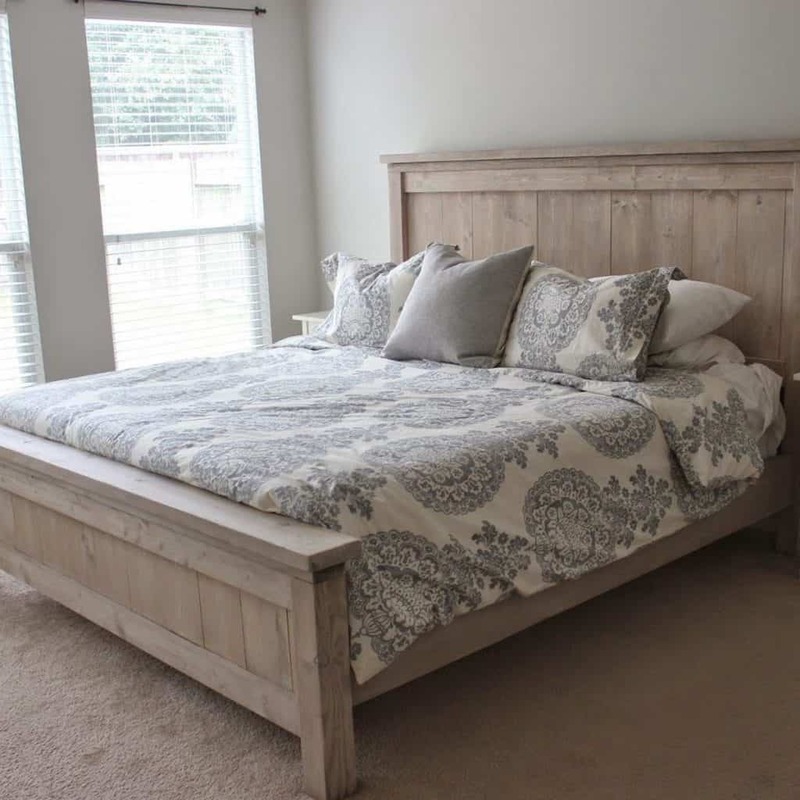 The frame was made of reclaimed wood, and the headboard is very simple. Adding patterned bedcover and pillows creates a nice place to relax. 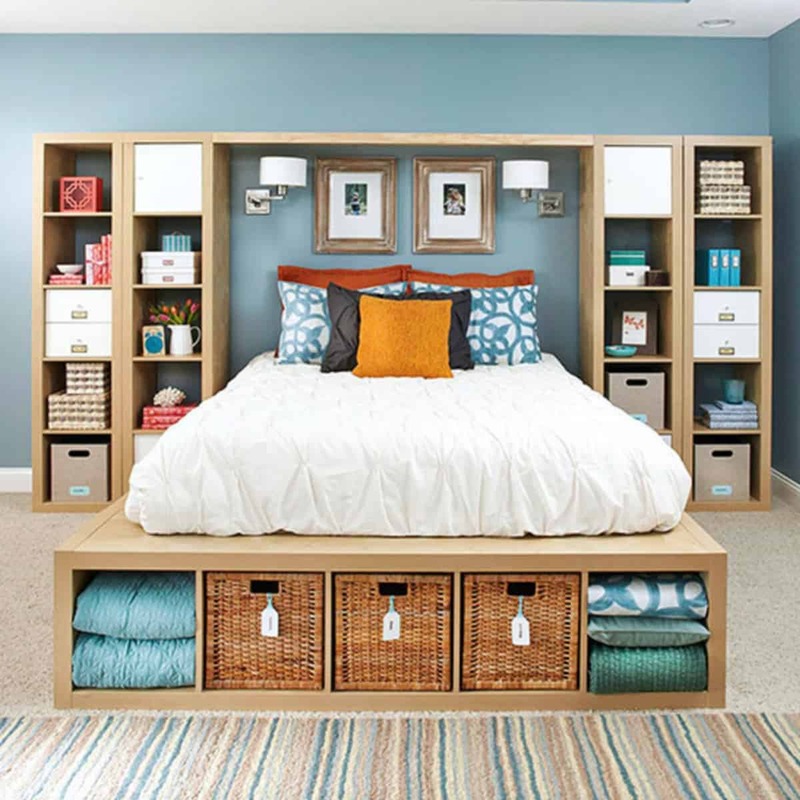 Make your room design more efficient with underbed storage space. This platform bed with storage was constructed slightly higher. The underbed space is used to store laundry basket and books. The extra space also raises the bed to a perfect height for adults. 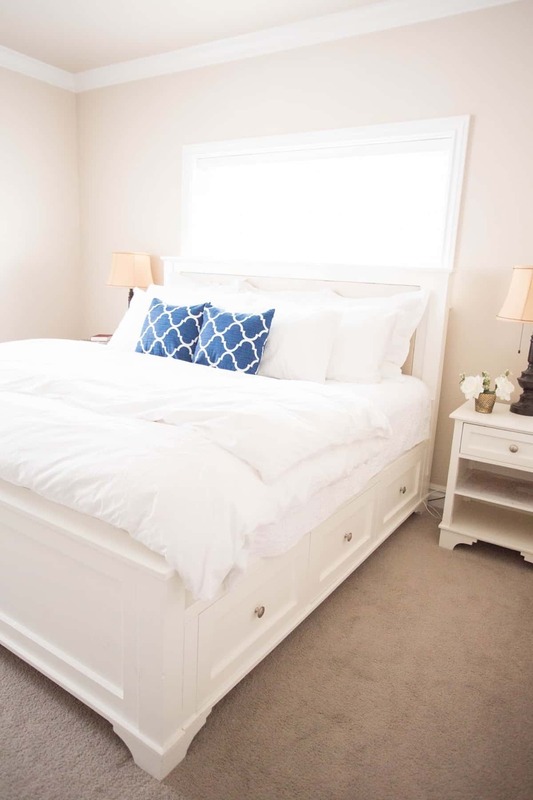 This king platform bed looks elegant with white paint. The color helps to elevate a simple bedroom, creating a beautiful and mature look. The simple headboard provides adequate back support. 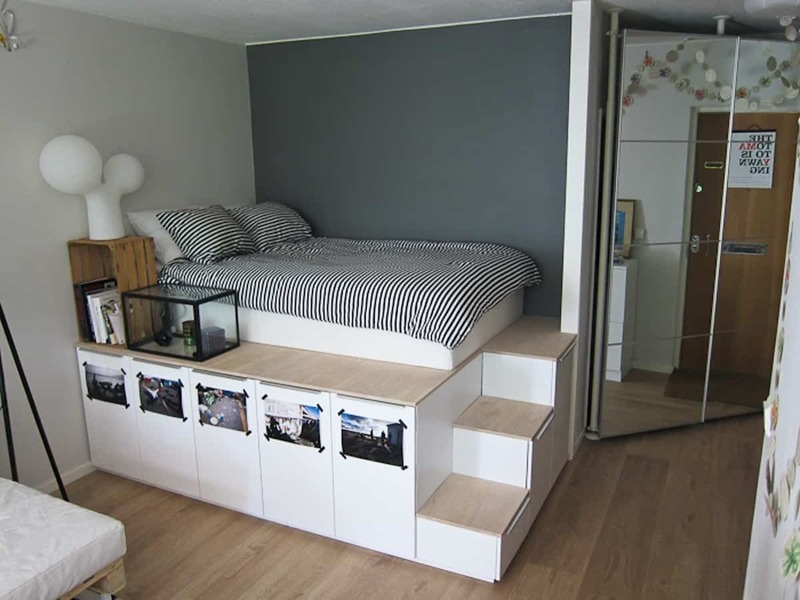 The underbed space was used to create drawers, adding a practical element in this simple structure. 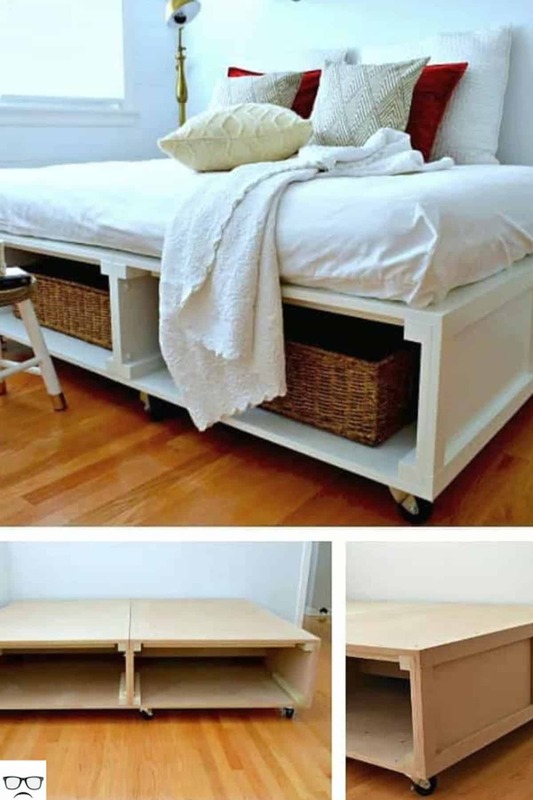 This simple platform bed has extra storage space underneath for various purposes. You can line several laundry baskets (like in the picture) to create a homey feeling. A potted plant makes the bed more interesting when viewed from a certain angle. 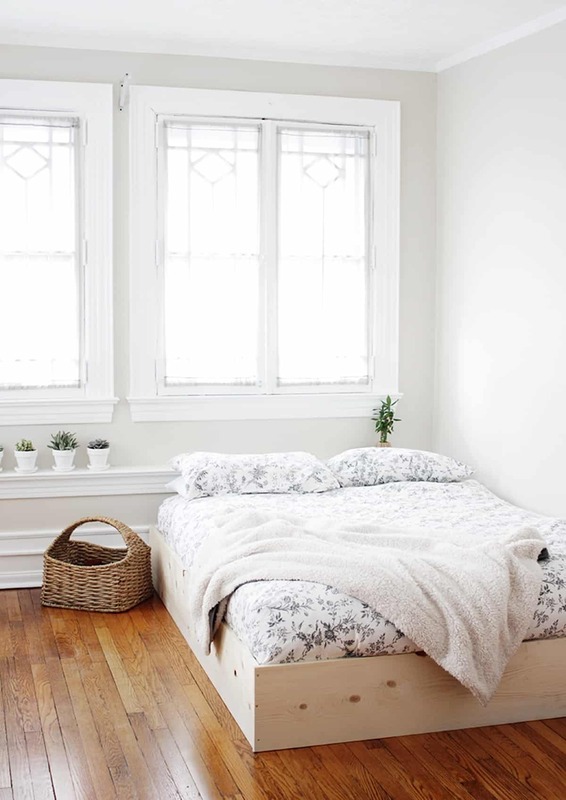 Make your bedroom more practical with this no-nonsense platform bed. The structure has hollowed, open space underneath. It serves as storage places for various objects. The design has no headboard, perfect for a simple room with limited space. This platform bed has a daybed-like vibe, with a platform that looks way wider than the mattress. The headboard looks more like a chair’s back. 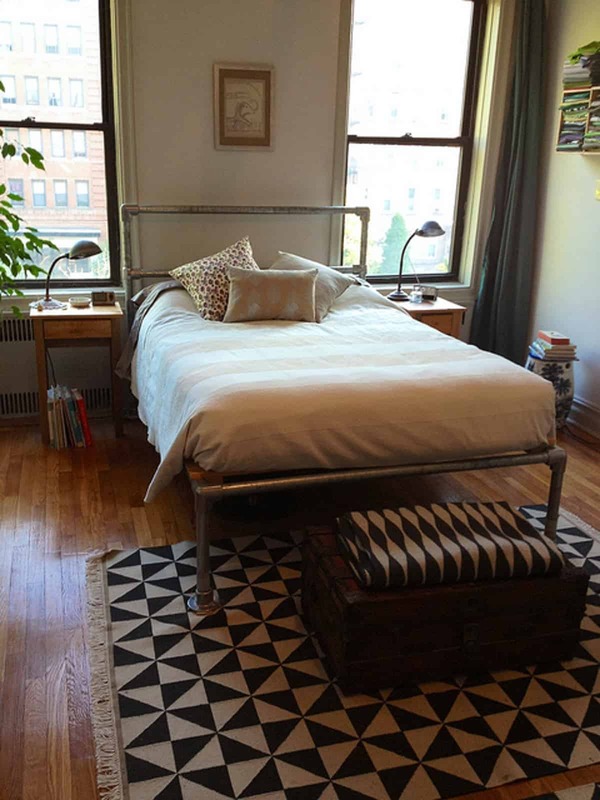 The spacious platform makes this bed a perfect place to unwind. 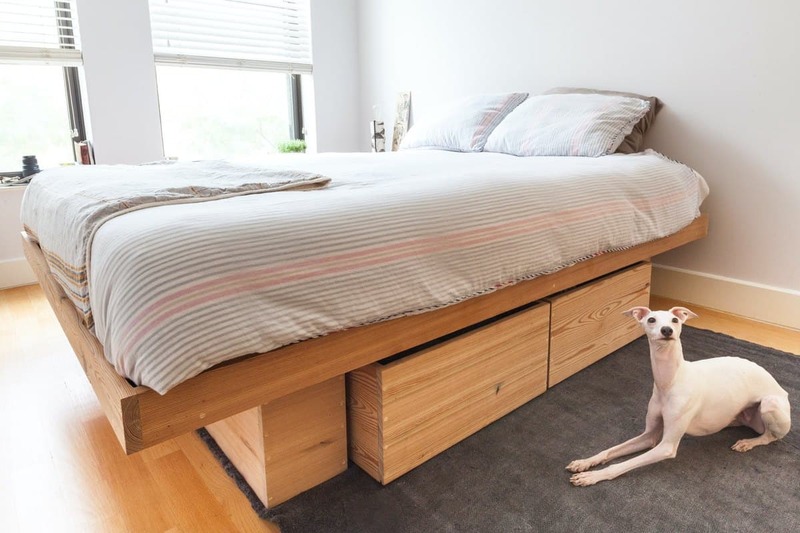 Maximize a small room by adding the height of your platform bed. In this image, the underside of the platform has several storage spaces with serious capacity. Installing a short stair is a practical way to reach the bed. 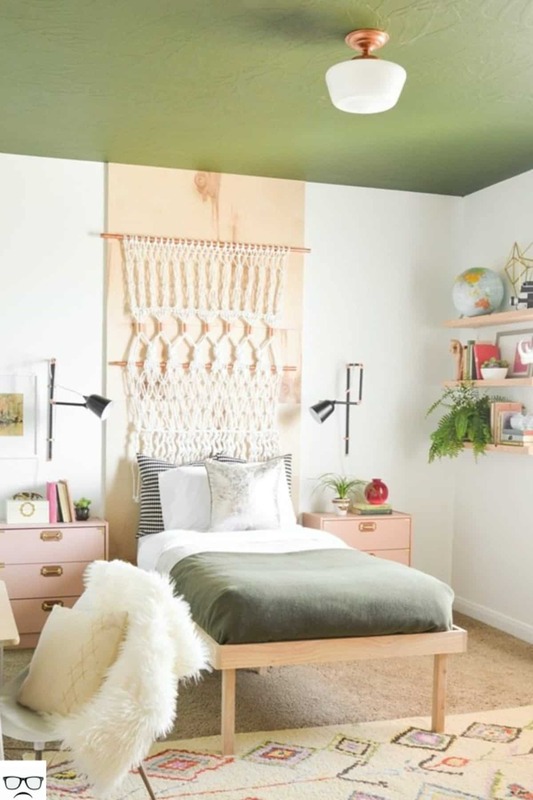 This platform bed looks common, but the paperclip/hairpin-like legs add characters. The legs are tall and help to create a “floating” look. 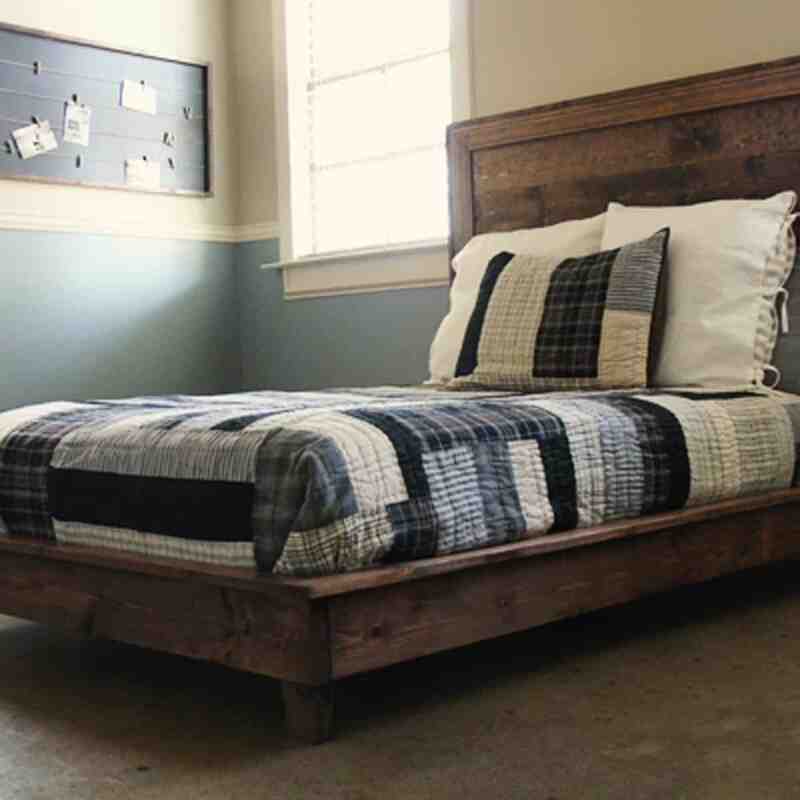 The reclaimed wooden board adds character to the bed. The colorful mattress complements the platform structure well. This simple platform bed has “all-square” structure. The platform is raised high by four legs. The bed has no headboard, and the size fits perfectly with the single mattress. This platform bed is perfect for any bedroom for a single occupant. 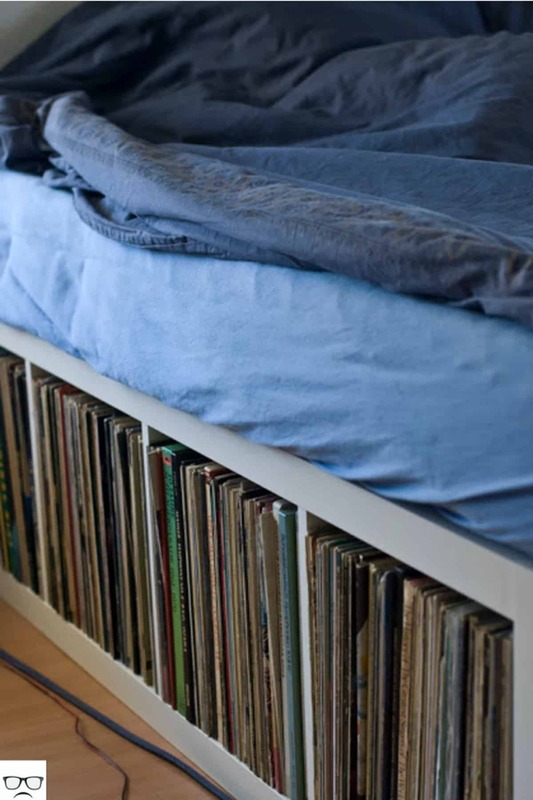 If you love the extra storage space in IKEA’s EXPEDIT bed, you can cut off some of its parts to create open storage. Many IKEA online tutorial sources suggest you cutting the bulks of the bed, leaving the most basic storage space. This simple platform bed with drawers is perfect for small room owners. The constructions look simple with dark-coated wooden panels and no-headboard design. However, the construction has large drawers filing all the sides. 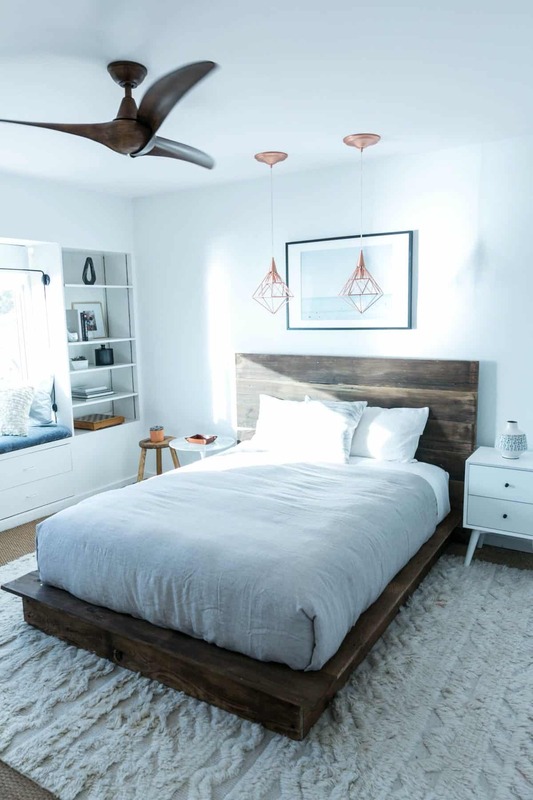 This floating platform bed was constructed with extended headboard. 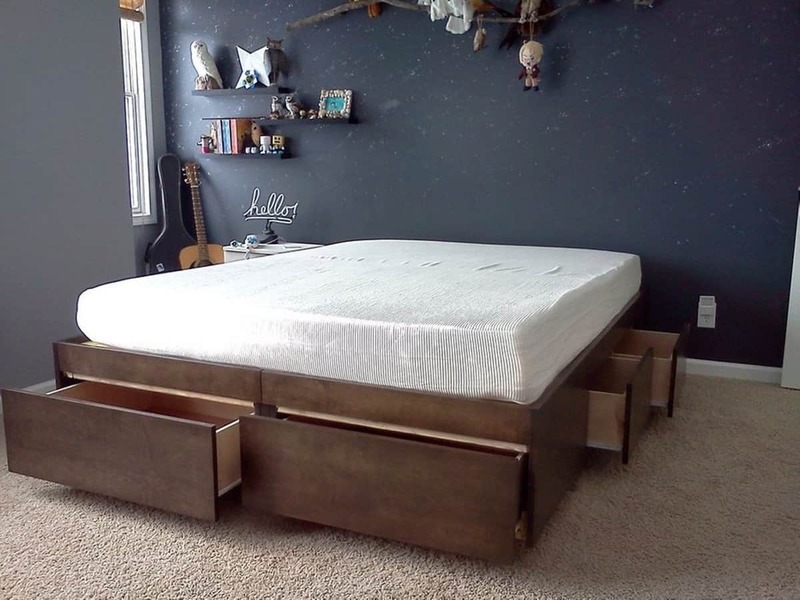 The extension parts were places for floating nightstands. The top pars are occupied by modern metal lamps. The nightstands have drawers and hollowed spaces on the side. This platform bed has a modular design, surrounded by various storage spaces. The underbed is divided into several sections for laundry baskets, towels, and spare pillows. The surrounding cabinet provides numerous storage space and creates “nest” headboard. A headboard part is also a great place for artworks. 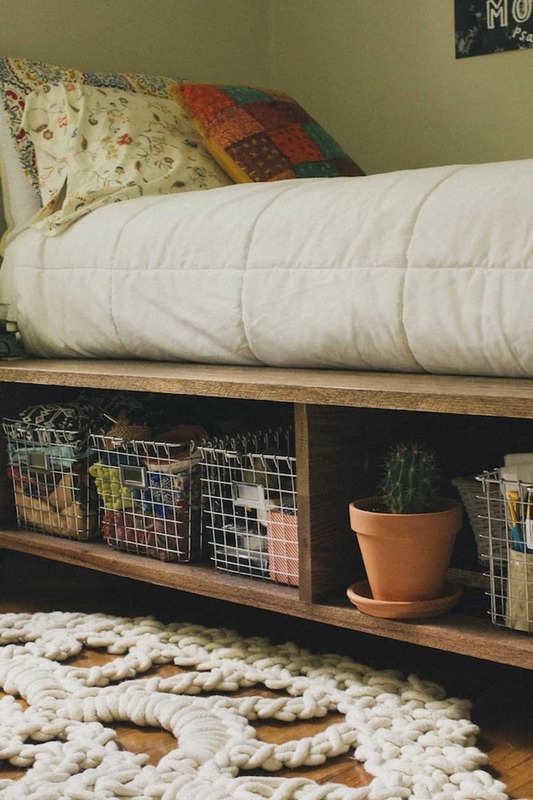 This DIY pipe platform bed is a perfect example of successful recycling. The pipe frames give characters to a regular bed. Pipes are strong enough to support your weight without adding bulks to the room. This box-style platform bed has easy construction, perfect if you are unsure about the strength of supporting legs. This bed has no headboard, relying on the beauty of mattress, bedcover, and pillows. The simple design makes it very welcoming and cozy. 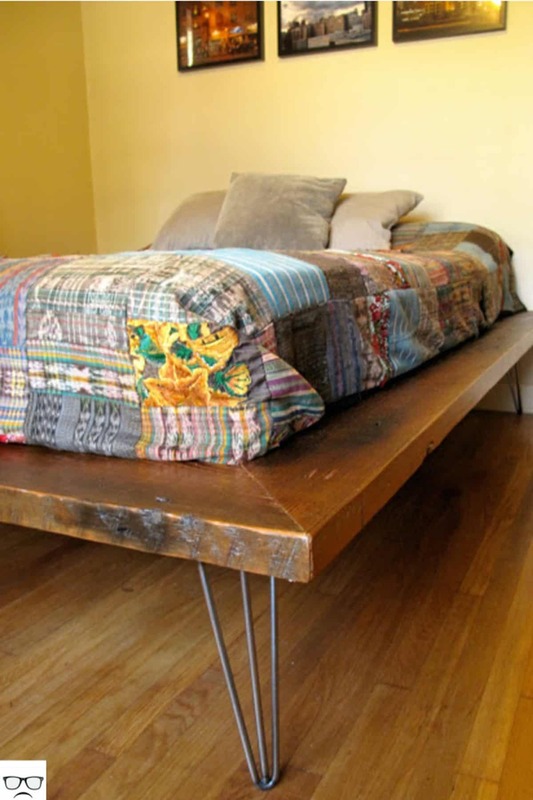 These 20 DIY platform bed ideas are simple but still interesting. Platform beds also keep you away from the dusty, dirty floor. Try one of these ideas as your weekend projects to get a cozy bed.